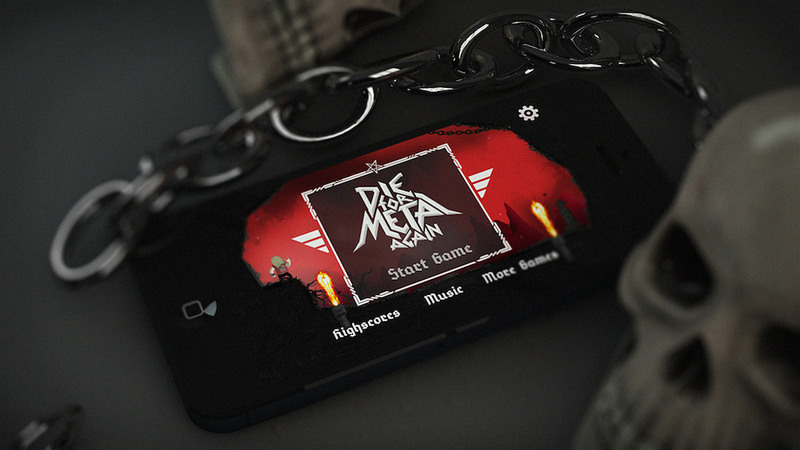 A new game for all of you metal heads hit Google Play today, titled Die For Metal Again. This is technically a sequel to the first Die For Metal game, which was one of the more challenging titles I have ever played. You die in that game. A lot. You play a headbanger who must work his way through countless levels, dodging saw blades, pissed off bouncers, and creatures from the abyss. You run, jump, and try your best to save your character from the inevitable death that awaits him. The actual “story” for the game is quite interesting. Rob Grinderface experienced an exploding death trying to listen to the new Gory Wardeath album. It was just too heavy. But there was no more room in hell for him, so now he has to fight his way through a dark afterlife to earn his place in hell. That’s right, you are trying to get into Hell. While playing, you will be treated to an amazing metal soundtrack, featuring tracks from bands such as Novembers Doom and These Are They. The game costs a mere dollar, so go grab it if this type of music and imagery pleasing your blackened soul.